Meigs freshman Ty Bartrum (4) breaks away from a trio of Gallia Academy defenders during the first half of a Week 1 football contest at Memorial Field in Gallipolis, Ohio. Last Week: Federal Hocking lost to Alexander 53-8, in Albany; Southern defeated Notre Dame 36-6, in Racine. Last meeting between the teams: Sept. 29, 2017. Southern won 55-14 in Stewart. FHHS offense last week: (-16) rushing yards, 50 passing yards. SHS offense last week: 114 rushing yards, 113 passing yards. FHHS offensive leaders last week: QB Hunter Smith 4-of-14, 5 yards, 1INT; RB Owen Roark 4 carries, 14 yards; WR Hunter Smith 1 reception, 37 yards, TD. SHS offensive leaders last week: QB Logan Drummer 7-of-10, 90 yards, 2TDs; RB Trey McNickle 12 carries, 99 yards, 1TD; WR Austin Baker 3 receptions, 33 yards. FHHS defense last week: 371 rushing yards, 67 passing yards. SHS defense last week: 267 rushing yards, 0 passing yards. 1. Federal Hocking’s last trip to Racine resulted in a 45-14 Tornadoes victory. The Lancers haven’t won in Racine since Sept. 14, 2012, which is also Federal Hocking’s last win in the series. Despite Southern’s five-game winning streak, the teams have split the last 22 meetings evenly. 2. The Lancers have lost 32 consecutive games, including 25 straight in the league. Federal Hocking’s most recent win came on Oct. 24, 2014, by a 16-14 count over Waterford, which has only lost five league games since then. 3. Southern scored in all-3 phases of the game last week, as Brody Dutton returned in interception for a touchdown, and Trey McNickle brought a kickoff back for six points. SHS did lose the turnover battle by a 2-1 count and was outgained 267-to-227 in total yardage last week. 4. Federal Hocking was nearly shut out last week, but scored its only touchdown with 2:06 left on the clock. Meanwhile, Southern was closing in on a goose egg victory, when Notre Dame found paydirt with 1:33 to play. 5. Southern has won six of its last seven home games, outscoring guests by an average of 23.1 points in that span. Waterford and Trimble are the only two visitors to leave Roger Lee Adams Memorial Field with a win in the last two years. Last Week: Meigs lost to Gallia Academy 47-34, in Gallipolis; St. Clairsville defeated Carrollton 31-13, St. Clairsville. Last meeting between the teams: Sept. 2, 2017. Meigs lost 47-6 in Rocksprings. Current head-to-head streak: St. Clairsville has won 1 straight. MHS offense last week: 86 rushing yards, 240 passing yards. SCHS offense last week: 228 rushing yards, 102 passing yards. MHS offensive leaders last week: QB Coulter Cleland 16-of-30, 240 yards, 3TDs; RB Zach Bartrum 10 carries, 80 yards, 1TD; WR Weston Baer 5 receptions, 30 yards. SCHS offensive leaders last week: QB Dustin Carrothers 5-of-8, 1TD; RB Brady Kolb 35 carries, 189 yards, 2TDs; WR Justin Heatherington 3 receptions, 57 yards, 1TD. MHS defense last week: 335 rushing yards, 155 passing yards. SCHS defense last week: 199 yards. 1. Last season was the first-ever meeting between the Red Devils and Marauders. This is the first time Meigs has played in Belmont County. 2. 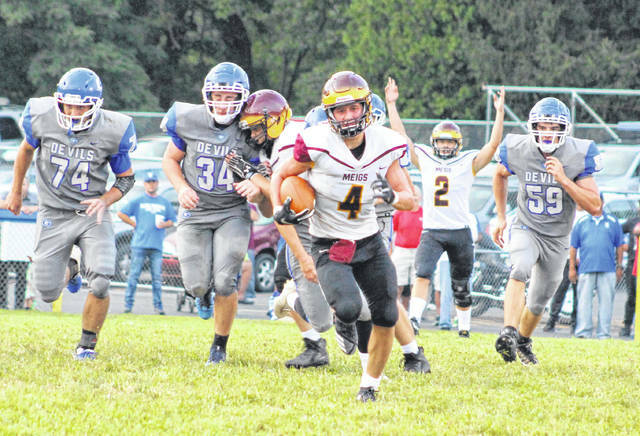 Meigs has lost five of its last six road contests, but has only been outscored by a total of 43 points in those contests, which includes a 40-point lost at Point Pleasant. 3. St. Clairsville carried the ball on 57 of its 65 offensive possessions in last week’s win. SCHS didn’t play flawlessly, however, as the Red Devils committed a pair of turnovers. 4. The Marauders held a one-point lead headed into the fourth quarter of last week’s game. The Maroon and Gold won the turnover battle by a 2-to-1 clip and gained 326 yards, but surrendered 7.5 yards per play to the Blue Devils. 5. Including a 2017 opening round playoff loss to Philo, St. Clairsville is 5-2 in its last seven home games, having outscored guests by an average of 9.1 points per game at Red Devils Stadium in that time. Last Week: Eastern lost to Huntington Ross 35-0, in Tuppers Plains; Caldwell lost to Buckeye Trail 28-13, in Lore City. EHS offense last week: 126 rushing yards, 49 passing yards. CHS offense last week: 94 rushing yards, 203 passing yards. EHS offensive leaders last week: QB Isaiah Fish 3-of-9, 32 yards; RB Isaiah Fish 7 carries, 47 yards; WR Sharp Facemyer 2 receptions, 20 yards. CHS offensive leaders last week: QB Tanner DeVolld 11-of-24, 203 yards, 1TD, 3INTs; RB Drew Ivey 11 carries, 37 yards; WR Zeke Liston 4 receptions, 71 yards, 1TD. EHS defense last week: 72 rushing yards, 150 passing yards. CHS defense last week: 107 rushing yards, 179 passing yards. 1. A total of 10 different Eagles handled the ball on offense last week, with eight players rushing the ball, two throwing passes, and four catching passes. EHS gained 3.89 yards per play last Friday. 2. Dating back to last fall, Eastern has been shut out in three of its last four contests, including in back-to-back road trips. EHS was blanked four times in all last season. 3. Caldwell suffered through six turnovers — three interceptions and three lost fumbles — in its opening week loss. The Redskins chose to run the ball on on 31 of their 55 offensive plays and had an 85-yard kickoff return for a touchdown by Drew Ivey. 4. Last week, Eastern held the Huntsmen off the board for the first 12 minutes of play, but gave up 28 points over the next 12 minutes. The EHS defense surrendered three rushing touchdowns and a pair of passing scores, while allowing 4.9 yards per play in last week’s setback. 5. Both of these team finished 3-7 a year ago. All-3 squads that Caldwell defeated had one-win campaigns. The three teams that Eastern defeated in 2017 also had three wins between them.